If you need fast stove repair in Los Angeles and the job expertly completed, rely on our services. Common stove issues are related to their burners, but there might also be a problem with the indicator light or the receptacle. As a professional company, our Magic Appliance Repair in Los Angeles is equipped to replace the burned switches and any other part of your kitchen stove. We are specialists in kitchen appliances and their services, and provide fast response assistance. Count on our electric and gas stove repair service if you are a resident in Los Angeles, California. We offer quick local services and our technicians come well-equipped in order to fix any problem with this appliance. Although there are several types of stoves available on the market, our experts are skilled to repair any model. From standard cooktops made by any large brand to range stoves, we can fix and replace parts of any such cooking appliance. When it comes to gas stoves, we help with problems as fast as possible. 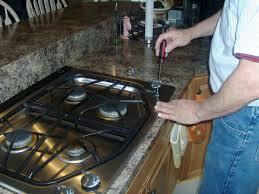 Trained to offer gas stove service, our technicians can fix urgent problems but also maintain the appliance. When gas is involved, appliances can get very dangerous if they are not quickly fixed and properly fitted. That’s why you should call us the minute there is a strange odor in your kitchen. All LA residents are served by our local company in a timely manner. For safety reasons you should trust gas stove installation to us too. We are trained to fit any electric stove as well and pay attention to all wires since good contact ensures proper stove operation. But we pay even more attention to gas stoves to make sure the client will not face problems with gas emissions when using the appliance. We have a qualified team at our company and our techs are ready to take care of your Los Angeles stove repair requests in timely fashion. Just call to report problems or concerns.